We would like to thank you for choosing Mag Paper. Built by the latest version of WordPress and used with WordPress only as well as using the powerful page builder plugin Visual Composer. Now let’s jump to the theme presentation. In this section, we present Recommended PHP configuration limits and how to verify your current PHP limits. But before that, make sure that you’re running the latest version of WordPress, PHP version 5.6 or higher and MySQL version 5.6 or higher. Verify your PHP limits in Dashboard >> Mag Paper >> System Status. Or contact the server provider to confirm your current PHP limits are and have them set it up again if neeed. child-theme: There is a zip file child theme and a readme.txt about some notes about child theme. In this video, we will give you a step-by-step tutorial of creating a blog, magazine or newspaper website using the best Mag Paper WordPress theme. You can install the theme by 2 ways: Via WordPress or via FTP. Step 1. Dashboard >> Appearance >> Themes >> Add New. Step 2. Click Upload Theme button. Step 3. Browser magpaper.zip file in your computer and click Install Now button. Step 4. Active Mag Paper. Step 5. After active the theme, you will see Mag Paper notice!. Click “Install and active ThimPress Core to start now! “ to active core of Mag Paper, move to importing demo data process. Step 1. Login your FTP account via an FTP software to access your host web server. Step 2. Unzip magpaper.zip file. Step 3. Upload the exacted theme folder magpaper to wp-content/ themes folder. Step 4. Active the theme in Dashboard >> Appearance >> Themes. 1. Mag Paper requires Thim Core plugin to work. This plugin have to be actived as soon as you uploaded the theme. As we mentioned in section Upload Theme, afer you upload the theme, there will be a notification message “Install and active ThimPress Core to start now! ” This is Thim Core plugin. The plugin provide neccessary settings to create advertisements. The popular choice for monetizing your website with adverts while keeping things simple. Start making money today! 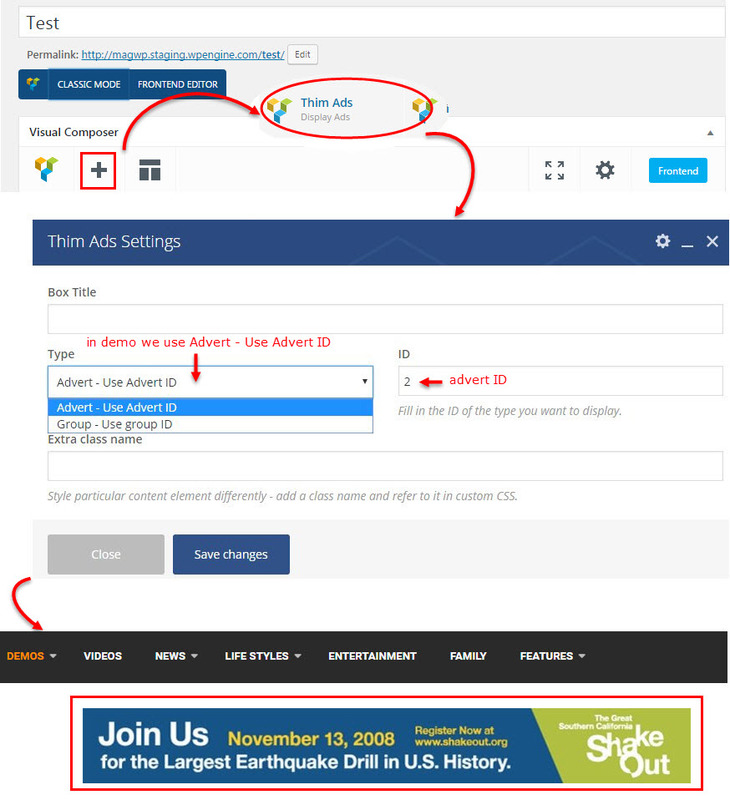 Refer this article about how to insert ads to your posts. Hope it’s useful for you. There are 2 common ways to update the theme: Via Envato Toolkit – automatically update and via FTP – manually update. We ThimPress has developed another way to update theme via Thim Core plugin. The updating will not loose your changes before but to be safety, you should backup files and database before updating. After updated, re-save customize in Dashboard >> Customize >> click Save & Publish. With thim core plugin of ThimPress included in Mag theme, you can auto update theme faster and easier through an account from envato by going to Mag Paper >> Dashboard >> click “Login With Envato” to update theme. Step 1. Login you Envato account. In Download tab, find Mag WP and choose the Installable WordPress Theme (the WordPress file). Step 2. Login your server, then go to wp-content/ themes folder and backup your magpaper theme folder if you want or delete it. The content in your site will not be lost but if you have modified code, the changes will be lost. You have to reapply them after updating over. Step 3. Exact new file magpaper.zip you have already downloaded from Themeforest. Step 4. Drag & drop new theme folder magpaper to wp-content/ theme to override the existing files. A child theme is a theme that inherits the functionality and styling of another theme, called the parent theme. If you modify a theme directly and it is updated, then your modifications may be lost. By using a child theme you will ensure that your modifications are preserved. Mag Paper provides an available child theme so that you just need to upload to your site without doing anything else after installed the parent theme successfully. Child theme of Mag Paper is a zip file named mag-paper-child packed in child-themefolder after exacted theme package (child-theme/ mag-paper-child). Uploading child theme is similar to uploading parent theme. Step 1. Appearance >> Themes >> Add New. Step 3. Browser child theme mag-paper-child.zip file in child-theme folder and click Install Now button. Step 4. Active child theme. Codex WordPress about Child Theme. The easiest way to import our demo content is to use our Thim Core Demo Importer. Our importer will give you all pages and posts, several sample sliders, widgets, Customize Options, assigned pages, and more. This is recommended to do on fresh installs. It will not replace content like posts, pages, portfolio, etc , it will not delete current menus but configure our demo menus, and it will not replace but add sliders. Another method is manually importing. 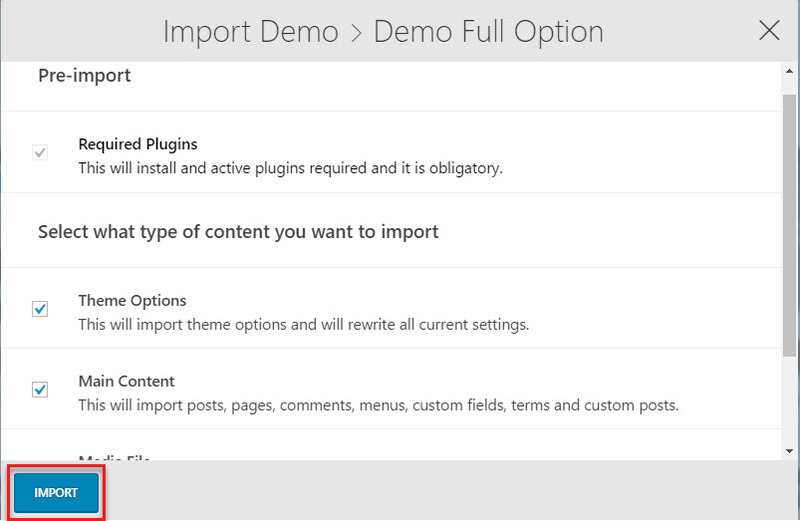 Step 1 – Navigate to Dashboard > Import Demo. Step 2 – Select a demo and click Install button. 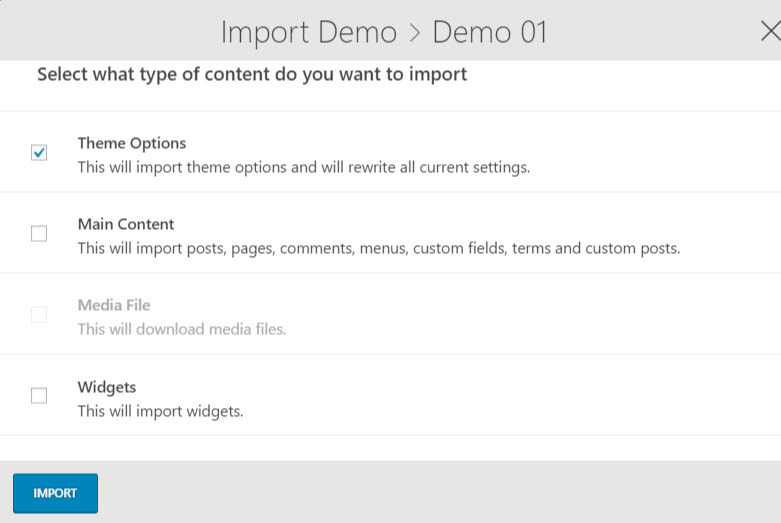 Step 3 – Select what type of content do you want to import and click Import button. The import process may take up to 5 minutes. Enjoy a cup of tea while you wait ?. In the event that your host will not make changes, or you cannot get the demo content to import, you can then import the individual elements manually. Continue reading below to learn how to manually import demo content. There is a “content.xml” file placed in folder name-theme/inc/data/demos, just select a demo you want then find this file for importing demo. Step 1 – Go to Dashboard >> Tools >> click Import. Step 3 – Click Choose File, then choose the content.xml file from your desired demo folder. For example, if you would like to install the Demo-01, you would install the content.xml inside the Demo-01 folder. 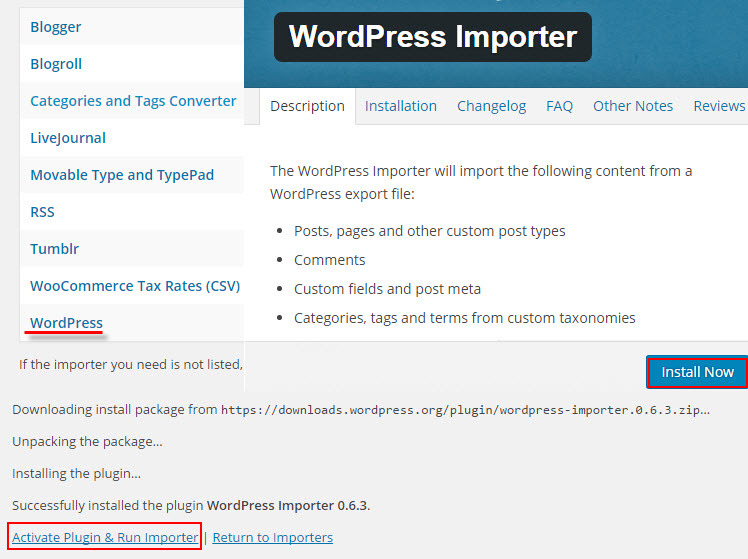 Go to Dashboard > Demo Importer >> Select a demo that you imported XML file and click Install button >> Select content “Theme Options” and click Import button. Step 2 – Go to Dashboard >> Tools >> Widget Settings Import. Step 3 – Click the Select A File button, and select the widgets_data.json file from the same folder you got the XML and theme option files you’e just imported. Example: name-theme/inc/data/demos/demo-01/widget. After importing demo data successfully, some elements setup of the third-party plugins will not be included. You need to complete them. Once installed and imported demo data, you can manage it in the Dashboard >> Contact >> click Add New to create new contact forms for different parts of your website or edit the existing ones via the Edit option in Contact Forms tab. 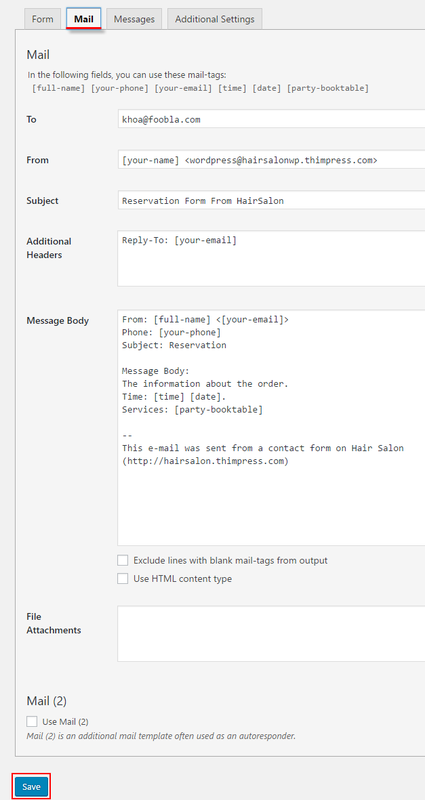 You can put any content of contact form and click button “Save” then a shortcode will be auto created. Just copy this shortcode into post, page, or text widget content that you want. The most important settings you need to define are located in the Mail tab. 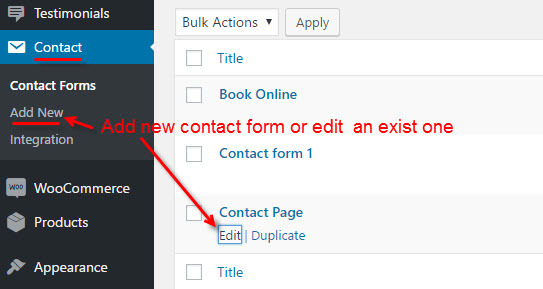 To learn more about setting email, you can refer document of contact form plugin. Notes that click “Save” after setting. 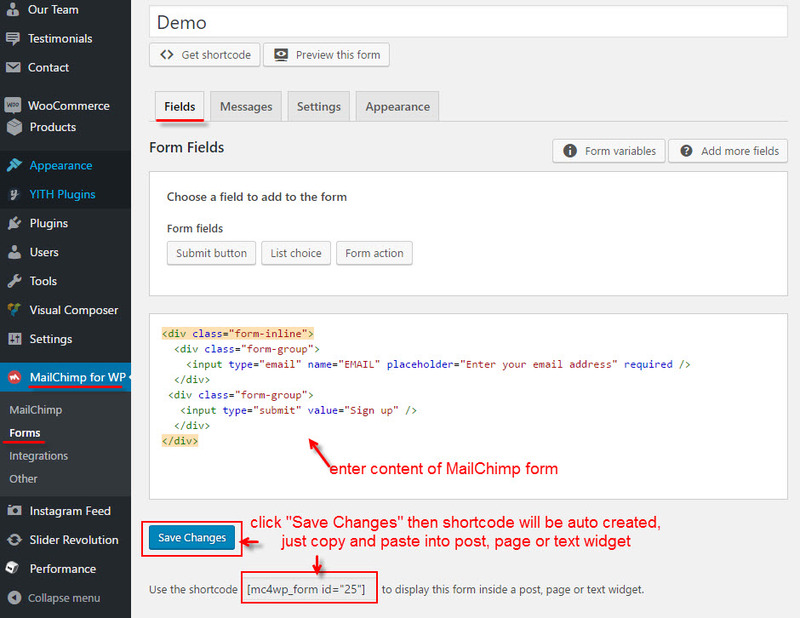 Go to Dashboard >> MailChimp For WP >> MailChimp >> Setting your API Key then click “Save Changes“. 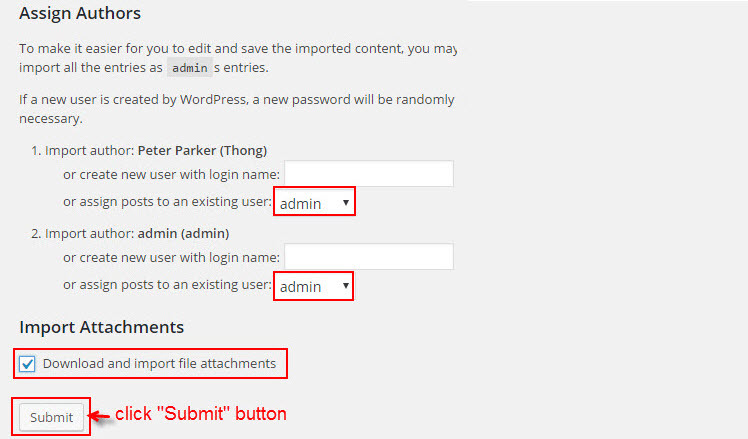 To learn how to get API key, you can refer document of MailChimp. This is place to customize all sections on your site. After you finished customizing this section click the Save & Publish button. This option gives you the freedom to decide how to display the header logo on scroll. Go to Dashboard >> Appearance>> Customize >> General >> Logo. 1. Sticky Logo: Upload your logo and on your sticky logo will be loaded the header logo. If users want to change sticky logo, they can click “Remove” then “Change File” to replace sticky logo. 2. Retina Logo: This option allows you to add to your sticky menu a mobile logo. The Site Icon is used as a browser and app icon for your site. Icons must be square, and at least 512 pixels wide and tall. It should be in one of the following formats: .ico, .png, .gif. Usually we should use .ico. This is place to configure layout site, archive, single, normal page. 1. 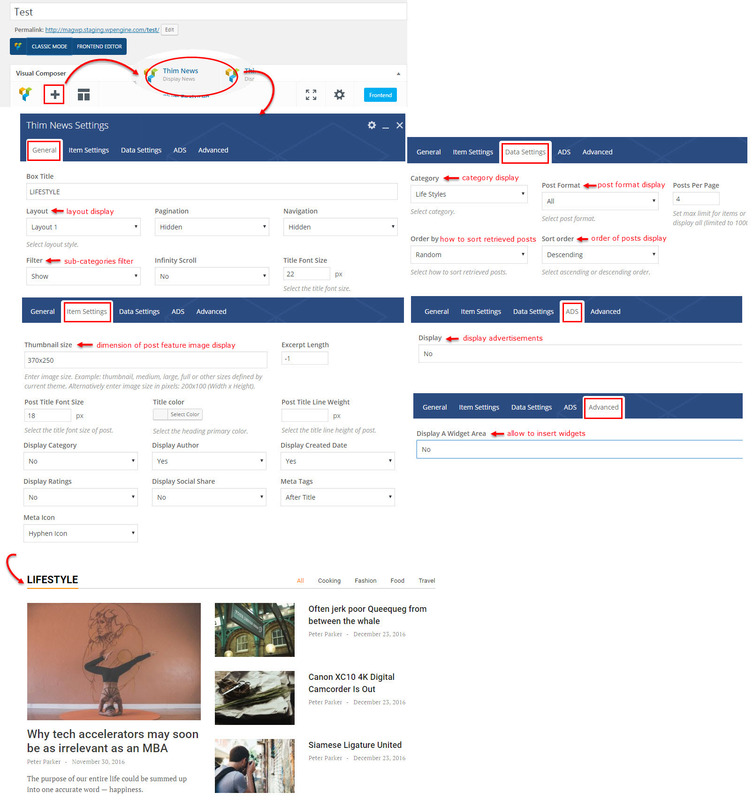 Site Layout: To select layout of content site. There is 2 layouts, you can select boxed or wide. 2. Page Layout: To select layout archive, single, normal page. You can choose whether or not to use the sidebar, as well as positioning it in a layout with 1 or 2 columns. 1. Primary Color: Each of our theme will have one major color called “Theme primary color”. The elements of the primary color are included with: Hover Text color of buttons, hover social link icon… If you configure any color, it also will be applied similarly to these elements. 2. Select Color, Image, Pattern: This is place to select background color or background image or pattern if select main content or boxed bacground. All typography options are located within their specific Customize panel. 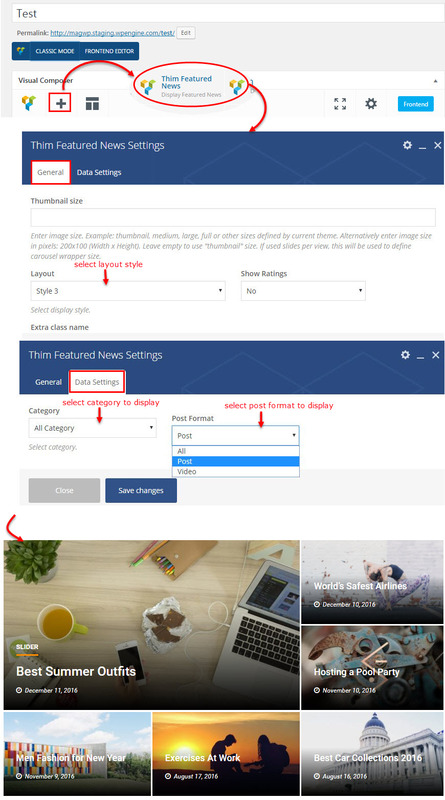 For example, if you’d like to customize your main menu typography settings, then you would find those options in the Dashboard >> Appearance >> Customize >> Header >> Main Menu tab. If you don’t find the typography settings for a specific feature, it may be because it’s been combined into a header typography option in Dashboard >> Appearance >> Customize >> General >> Typography. 1. Body Typography Options: To customize the Body Font, navigate to the Appearance >> Customize >> General >> Typography >> Body Typography tab where all the Body Typography options such as font family, weight, size, etc. are found. 2. H1 – H6 and Post Title Typography Options: To customize the Headers and Post Titles Font, navigate to the Appearance >> Customize >> General >> Typography >> Heading tab where all the Headers and Post Titles Typography options such as font family, weight, size, etc. are found. 3. Specific Typography Options: To customize specific typography options, such as Main Menu, Top Bar, Page Title, Sliding Bar, Sidebar, navigate to their specific panels to access their different typography options such as font family, weight, size, etc. Font Family: This option allows you to select a font family to use. Variant: This option allows you to select a font weight and style to use. Subset: This option allows you to select which subset to use. Font Size: This option allows you to set the size of the text on display. Line Height: This option allows you to set the spacing between lines. Letter Spacing: This option allows you to set the spacing between letters. Text Transform: This option allows you to set uppercase or lowercase. Color: This option allows you to set the color of the text. Extra Featured tab to allow support something such RTL language, smooth scrolling, open graph meta tags, back to top button, google theme, google theme color, preloading animation, suggestion post, trending searchs, write HTML content. We designed 6 beautiful layouts for header to offer you multiple options for customizing your site. You can choose what items you want to display and how to order them in this section. 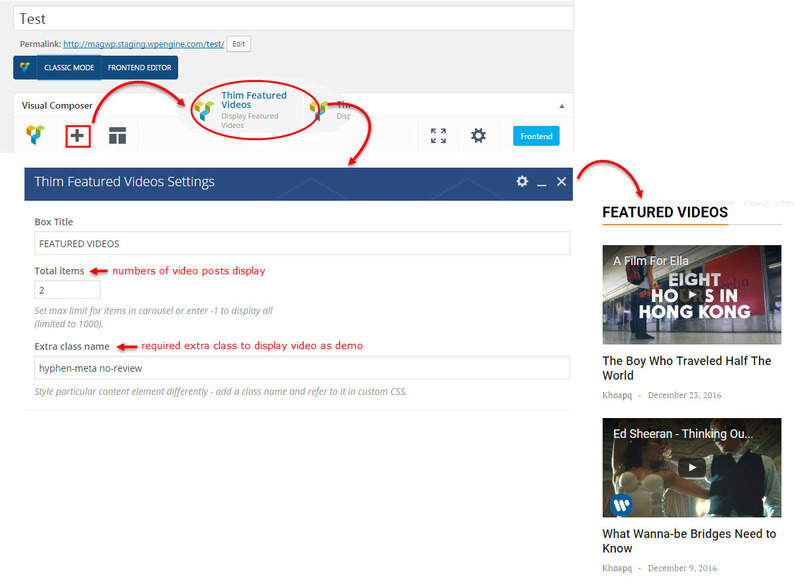 Please see below how to customize it in Dashboard >> Appearance >> Customize >> Header and expand the Layout section. 1. 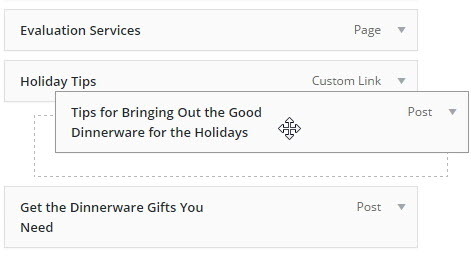 Layout: You can decide how to order the items on header. Choose one of the three layouts and click on it. 2. Header Width: There are 2 styles for header position is “box” or “wide”. 3. 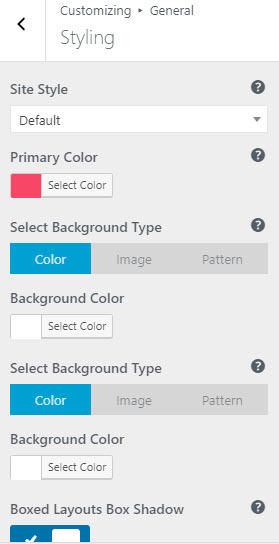 Background Color: Select background color for header. The top bar is located in the top section of the header and give you the option to display the data, top menu and social icons. 1. Show Top Bar: The theme comes with the Top Bar enabled by default. If you would like to disable it just go to Dashboard >> Appearance >> Customize >> Header and expand the Top Bar section. Turn off the button in the Show Top Bar section. 2. Show Top Widget Area: Click to show or hide top widget area. 3. Top bar Fonts: You can decide what font size or color of text you want to display on the top bar section. Go to Dashboard >> Appearance >> Customize >> Header and expand the Top Bar section. Select the desired font size and color from Topbar Fonts option. 4. Background Color: Choose whatever color of background color that you want. Mag Paper theme is so flexible that you can choose where you want to use the menus. Theme supports custom WordPress menus, with multiple levels of drop down for the main menu. There are 2 areas of the theme where you can display a menu: the Main Menu and the Footer Menu. In this section you will learn how to create a new menu, and customize the Main Menu. Theme comes with some general options for the Main Menu. Go to Dashboard >> Appearance >> Customize >> Header and expand Main Menu section. Mag Paper theme offers several theme options to customize the menu. They are located in Appearance > Customize > Header >> Main Menu tab. Users can customize the fonts, change color and height of menu text. Step 1 – Navigate to Appearance >> Menus section of your admin sidebar. Step 2 – Click the Create A New Menu link to make a new menu. Enter the name then click the Create Menu button. Step 3 – To add a menu item, select one of your created pages on the left hand side and click the Add to Menu button. You can also add all kinds of different posts from the left side. 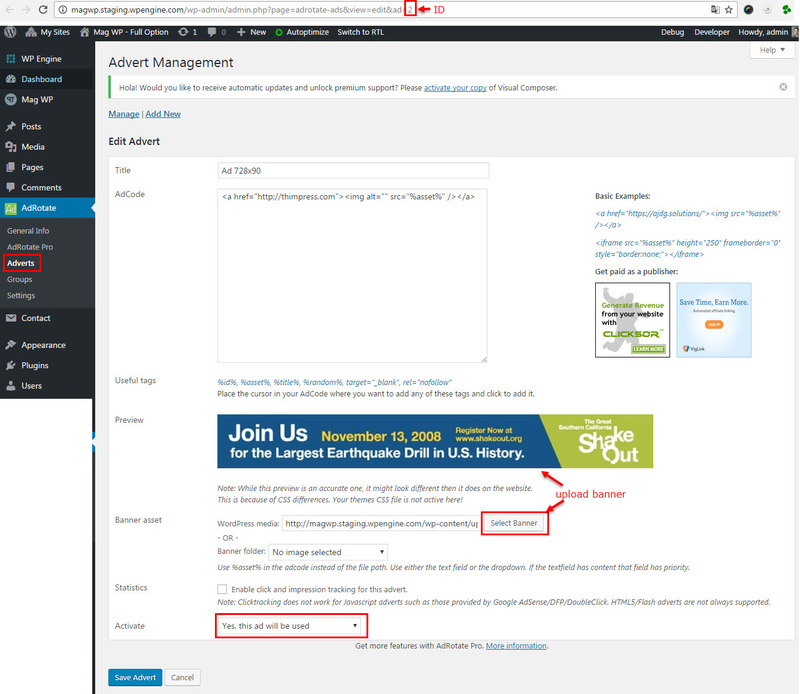 Step 4 – To add a custom menu item, enter a custom name and link into the Links box. Step 5 – Manage your menus by using the drag and drop functionality. To create a dropdown menu, simply drag a menu item below and slightly to the right of another menu item, and it will lock into place and create a dropdown section. Step 6 – After setting up your menu, scroll down to the bottom of the page to assign “Primary Menu” in the Theme Locations box if you want this is “Main Menu”. Step 7 – Once its all done, make sure you click the Save Menu button. Mag Paper theme offers several theme options to customize the sub menu. They are located in Appearance>> Customize >> Header >> Sub Menu tab. Users can change color of background, text, text hover for sub menu. Once you’ve moved your sub-menu items, remember to click Save Menu. Mag Paper theme supports to has a sticky header option. For improved usability, as the user scrolls down a page, the sticky header activates ensuring the website’s main menu is always accessible. 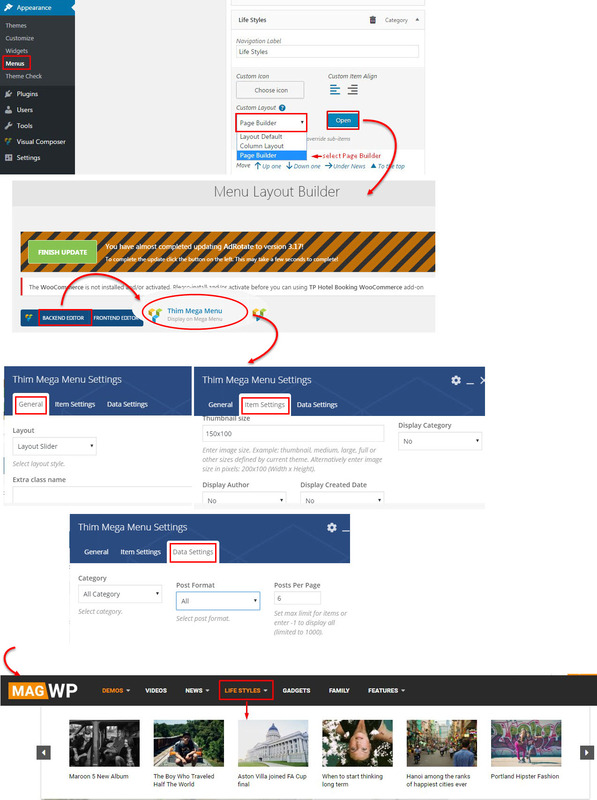 To manage the sticky header, Mag WP theme includes several options for styling, as well as visibility options to enable or disable it on various screen sizes. Below is a list of all the available options for the Sticky Menu. These options are located in Dashboard >> Appearance >> Customize >> Header > Sticky Menu. 1. Show Sticky On Scroll: Enable/disable the sticky menu. 2. Select Style: Select style menu when scroll. If select “The same with main menu” then users do not need to configure for main menu when sticky anymore. 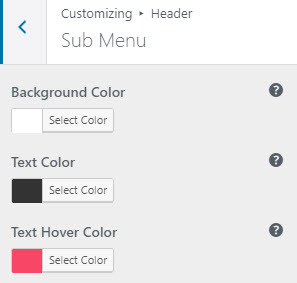 If select “Custom” then users need to configure color for text, background, text hover for main menu. This is place to be designed to configure for blog page, blog single posts. 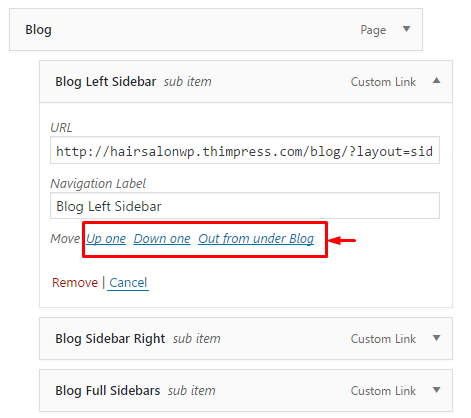 You can find options to fully configure related blog items in Appearance >> Customize >> Blog >> Setting. Archive page: Select blog layout, sidebar on top/bottom blog page, blog columns, configure excerpt length for all post in blog, show read more button, turn on/off sticky. Single page: Single post style, turn on/off infinity scroll, turn on/ off comment post, disqus shortname, show related post, numbers of related post, turn on/off related post popup, show/hide random widgets, number widget display, turn on/ off navigation post. This is the place for you to select an alignment for your blog page, which is a page to display posts in your site. You can choose whether or not to use the sidebar, as well as positioning it in a layout with 1 or 2 columns. Allowing to turn on/ off author, date, category, tag, comment number on post blog. 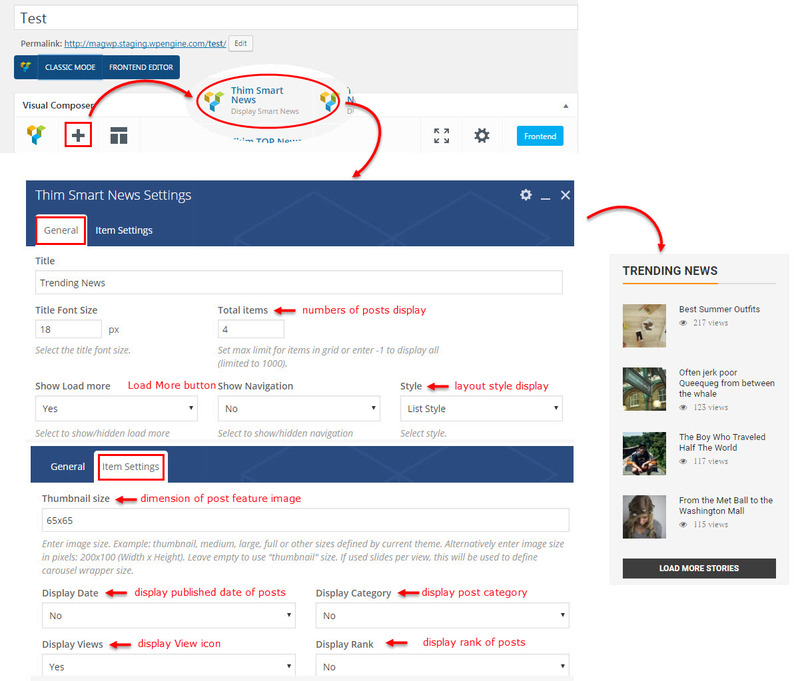 There are some available social links to share posts, you can select show/hide social links. Mag footer consists of the widget area and the copyright area. Both of these areas can be configured in Customize. Footer Widgets are added in the Footer Sidebars. 1. Show Footer Widget: This option allows you to show or hide Footer Widget area. 2. Background Color: Pick a background footer color. 3. Colors: Pick color for tittle, text, link, hover on footer section. 1. Show Copyright Text: This option allows you to enable or disable copyright text section. 2. Background Color: Pick a background color of copyright section. 3. Colors: Pick color for text, link, hover on copyright section. 4. Copyright Text: Enter text in copyright section. Widgets add various content or features to your site. They can be added, removed, and rearranged in Dashboard >> Appearance >> Widgets tab >> Footer Sidebar. Step 1 – First, make sure that you’ve enabled footer widgets on your site. To do this, navigate to the Dashboard >> Appearance >> Customize >> Footer tab >> Setting and switch the “Footer Widgets” option to On. Set how many columns you’d like to display by customizing the “Sidebar Number” option. Step 2 – Once you’ve enabled footer widgets, navigate to Dashboard >> Appearance >> Widgets tab to access the widgets and footer widget sections. 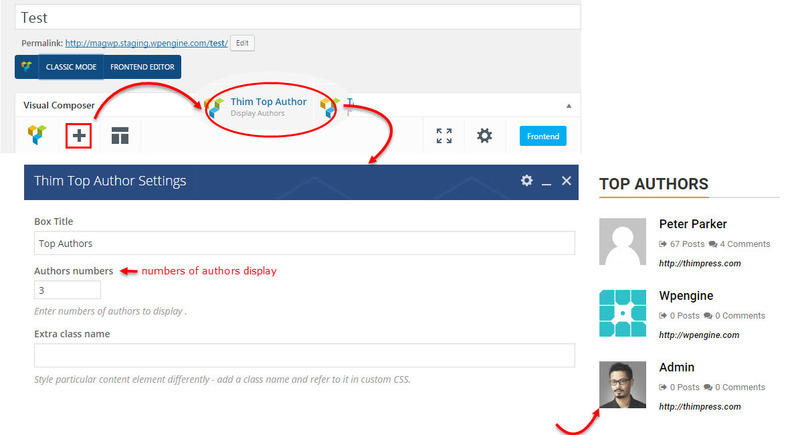 Step 3 – You will see a Footer Sidebar on the right hand side for each footer column you selected to have in Customize. Step 4 – On the left hand side are your widgets, simply drag and drop the widgets you want from the left side into the ‘Footer Sidebar’ sidebar on the right side. See the screenshot below. Mag Paper theme offers several theme options to customize mobile menu, mobile logo. They are located in Appearance > Customize > Responsive tab. Users can customize the fonts, change color and height of menu text on mobile by turn on Responsive section. 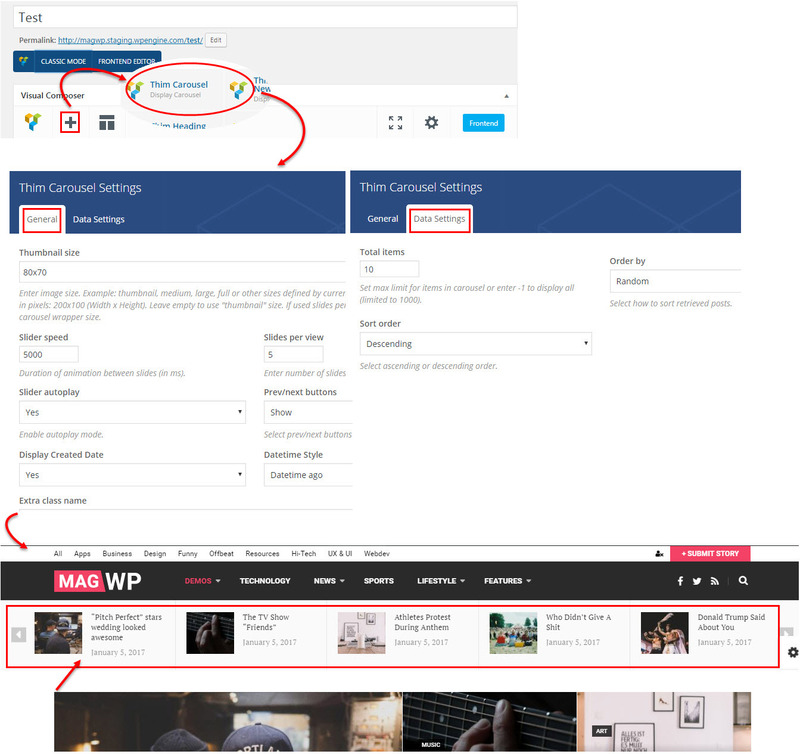 Mag Paper theme offers several theme options to customize breadcrumb for pages, single post. They are located in Appearance > Customize > ABreadcrumb tab. Select layout or background to breadcrumb pages, posts. Mag Paper theme offers several theme options to customize for author page, single post and home masonry of advertisment page. They are located in Appearance > Customize > Advertisement tab. Users can enter text/ HTML that displays on pages of advertisement. Thim Ads shortcode is created for Adrotate plugin, which creates adverts in site. This shortcode displays the authors created in Dashboard >> Users. When purchasing our themes, you will receive the free 6 months of support service for the questions and problems regarding the theme. Once the period of your support service is expired, you can extend support to 12 months. But no matter your support service of your product is over or not, you always receive free timelife updates for the theme. We really care about customer support services and guarantee to response to all support topics within 24 hours on weekday (a bit longer over weekend) since you posted a ticket. Regarding the problems with code customizations or 3rd party plugins, we are not able to provide free support service. We just can provide you customization service at a fee. Step 1. Click here to create an account on our website. You will need the Themeforest purchase code of your product. Step 2. Go to support forum of your product and create your own topic here. Read changelog and make sure that your site is running the latest version of Mag WP. Disable all 3rd part plugins because sometimes they’re the reasons causing the issues. 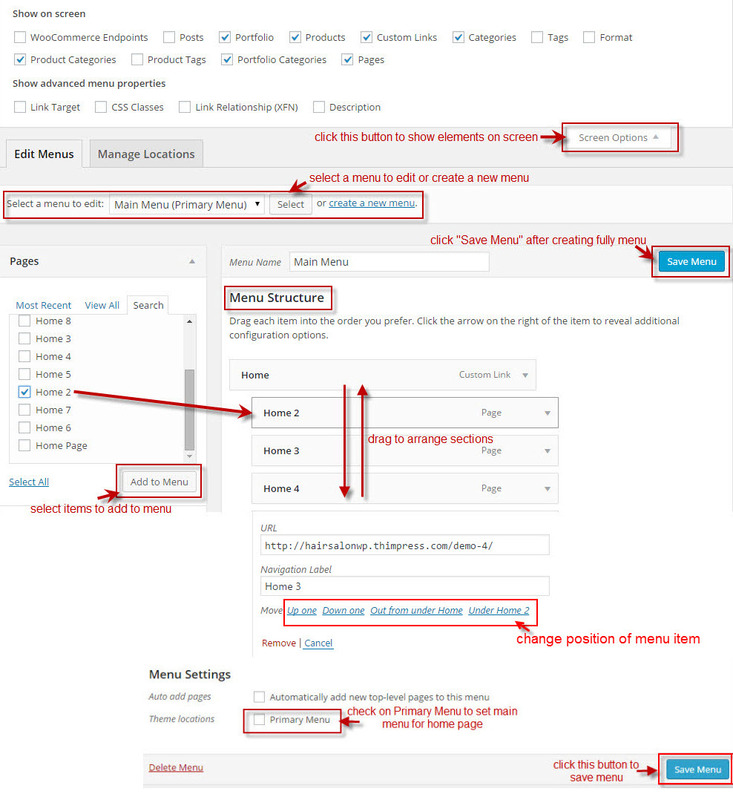 Clear all the caches after changing any settings in your site. And check out our Knowledge Base and FAQs below to find out the answer for your question. Will customization be lost if I update theme? No, your customization in Customize panel will not be lost if you update theme. Only the coding modification in original theme’s files will be lost and that’s why you should deploy in child theme. It’s due to your server error “500 Internal Server”. Read here to know about the error and how to fix it. User of server (e.g Apache, Nginx) can’t write file. Let chmod file style.css and config.less (all in the theme directory) is 777. Your PHP version is outdated. PHP version 5.6 or higher is recommended. There are also some sticky tickets we posted in purchased theme support forum. Please take a look these tickets. In case you can not find out the answer, don’t hestitate to let us know by submitting a ticket. You can use included premium plugins such as Visual Composer free when you purchase and download our themes from ThemeForest. So you don’t need to buy your own licenses to use these plugins. However, as a note from that plugin’s author, you (theme buyer) can not active and directly get support from them. So please don’t try to active these plugins by using theme’s purchase code. Please don’t worry if you see warning messages about the plugin license activation or update required. You will always get the latest version of Visual Composer…when we update the theme. We will test these plugins before send it to you to make sure there are no conflicts with our themes.